Cindy was this Wednesday (Jul 26) the celebrity bartender at Space Lounge serving shots to patrons. The singer was all sweaty as she juggled serving and enjoying Uganda Waragi punched with red wine. The mom of one was clad in a black and white polka dot sleeveless top on black shorts, she later perfomed for her fans. Doro Kats was the MC. 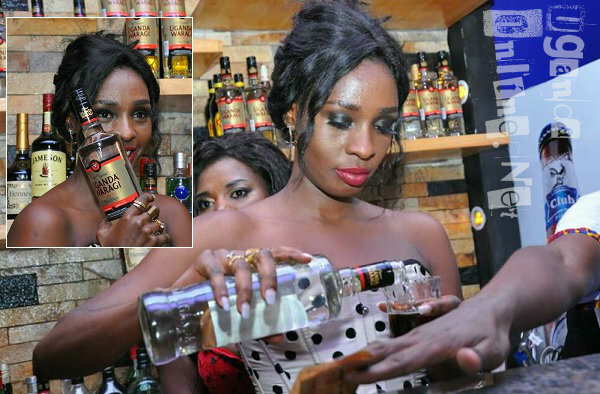 The bartending was done after her performance that left the fans yearning for more. Notable among those that attended were DJ Michael and Tonix. Cindy also launched her show dubbed; 'A Night with Cindy' that will take place on August 25, 2017 at Imperial Royale Hotel. "You came in such big numbers and Cindy's Performance was energetic. Let me take this opportunity on behalf of myself and Space Lounge at large to warmly appreciate you for being such an amazing team. We promise to offer you the very best because your happiness and full enjoyment is our goal as Space Lounge, Herbert Shonga, one of teh Club's proprietor noted. Cindy's girls doing the Jason Derulo Swalla dance! !